indra de lanerolle: Will convergence be good for Africa? Will convergence be good for Africa? Will convergence be good for Africa? And how do we come to an answer before it happens? This is not a trivial question. For convergence to happen we need significant political support. Regulations and laws need to be changed to enable the growth of broadband connectivity. Threats to existing businesses (including telcos and broadcasters), many of them state owned, need to be managed. And governments need to adapt to losing power in the dissemination of information. So we need to know something of the benefits if we are going motivate them to make it happen. I've just had a paper on convergence accepted into CPR Africa, a conference on communications policy research in Africa. In South Africa, and a number of other countries on the continent, while we can see (small) steps towards convergence taking place, television broadcasting is being protected from its implications. The paper I've written investigates whether convergence can take place while broadcasting is treated as a 'special case' and whether the arguments for protecting it are sustainable in a converged environment. But this begs a question that, it turns out, is not so easy to answer: "Is convergence a good thing for Africa?" Ithiel de Sola Pool defined convergence in 1983 before the internet existed. "A single physical means - be it wires, cables, or airwaves - may carry services that in the past were provided in separate ways. Conversely, a service that was provided in the past by any one medium - be it broadcasting, the press, or telephony - can now be provided in several different physical ways." So, convergence entails the lifting of constraints on content and communication services from being trapped in specific systems of transmission. It might seem obvious that convergence is 'good'. It means being able to do things that were not possible before. But its just as obvious that in the history of humankind, there are many occasions on which the ability to do something new has led to death and destruction. In developed countries there is already evidence for the economic benefits of convergence. But very little evidence from Africa exists. This isn't suprising. As Research ICT Africa's study of ten African countries in 2007/8 showed, less than one in twenty Africans are using the internet. Notwithstanding this reality, it is clear that the growth of the broadband internet is radically lowering costs of communication, not only in the most developed countries but across the planet. The growth of mobile has also transformed communications for many of Africa's people. But for most of those people, the (mobile) telephone is still a device to talk on, television and radio looks and sounds largely as it did decades ago (though more available and with more channels for some) and computers are still unavailable and expensive with very limited connectivity to each other. In other words, convergence is not yet a fact of life. There are some projects that are showing what can be done with today's technology and connectivity - in Ghana and Uganda, for example, farmers are getting market information that helps them get better prices for their produce. Other projects in South Africa are providing health information. There are many other examples but so far, they are mostly small in scale. And there are also many voices warning of its dangers. Cas Sunstien, now the head of regulation in the White House, in his book Republic.com 2.0, is one of those raising questions about the political dangers of the internet disrupting mass media. And, of course, many of those who work in, or own, the mass media are vocal in warning of the consequences of the damage to their industries. And in Africa, there is some debate as to whether the introduction of ICTs is creating internal digital divides. So if there is, as yet, little proof of the benefits of convergence, why are there so many of us so excited about it? I think the answer is to be found in the social, rather than the economic or political space. Barry Wellman has argued for many years that we need to understand the internet as a social network, the largest social network in (the history of) the world. And I think it is to be found in the hope of a new set of social possibilities that arise from that network. One of my favourite films is Witness directed by the Australian director Peter Weir and starring Harrison Ford. Most of the story takes place in amongst the Amish, a religious community in the Eastern United States who resist new technology (new in this case being anything later than the 19th Century). They drive around in horse drawn carriages, they do not have electricity. They only marry amongst themselves. 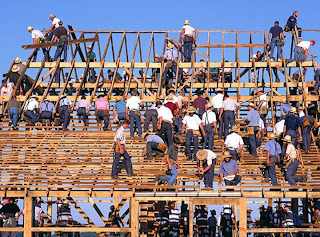 There is a famous scene in the film where Harrison Ford takes part in a community ritual where everyone comes from far and wide to help a family build a new barn. With hundreds of people, men women and children, they accomplish this feat in one day, using no power tools, and no paid labour. Just wood, hammers, ropes and nails - and the labour of the community. Harrison Ford is a policeman from New York. He is alienated from his neighbours, family and even from his police colleagues. In the Amish he finds a community, albeit an inward looking and with values that are not his own. But on the day they build the barn, it is a community in which he is able to participate. Last year we reached a global tipping point with more people living in cities than in rural communities. Those of us who have always lived in the urban world rarely experience the power of 'community' that Peter Weir captured. For most of us, it is not even nostalgia. Robert Putnam in Bowling Alone, has described how many of the practices of "community" - belonging to local social, sports and voluntary groups, for example, are all in decline. Mass media cannot create community. The nature of mass media is to create one-way one-to-many networks that connect us all but in which we have very limited means of participating. Harrison Ford could have learnt about the amish through mass media (as I did). But he could not have participated in building the barn. I see in the internet and in convergence, the possibility of community that is no longer entirely or predominantly bounded by space - by geography. And since, for most of us living in dense citiscapes rather than rural villages, we have little opportunity to participate in a 'community practice', convergence offers at least the possibility of achieving this via telecommunications networks. That is a revolutionary possibility. Many of the internet's pioneers, as well as scholars like Yoachim Benkler, Clay Shirkey and Henry Porter have recorded many examples of this community practice being enabled by the net. Examples they cite include Wikipedia, NASA's Seti project, open source collaborations such as LINUX and the creative commons project. Possibility and probability are different. Just because it can happen (and just because it has happened in some instances like Wikipedia) does not mean it will happen, in general, and specifically on this continent. In Africa, there are many political and economic obstacles that stand between this vision and its realisation. But understanding and communicating the vision and its power is, I believe, an important step in tackling the obstacles so that these possibilities are realised. So that, not only does convergence come to Africa, but it comes in such as way as to enable the power of community practice to reach all.